Mrs. Holt in the middle on the couch next to her son, Ronnie Holt. West Side Jr. Beta all around her. The West Side Jr. 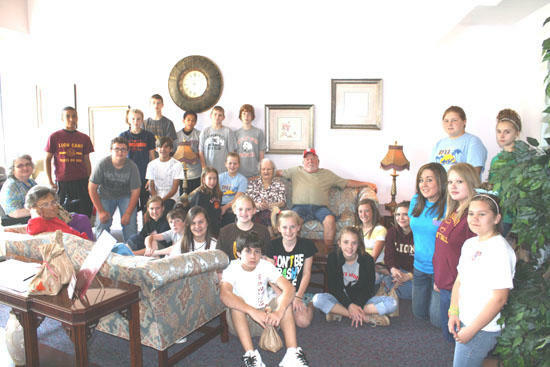 Beta Club visited the Holiday House on Wednesday, May 19, as part of a Service Project for May. They greeted the residents and handed out small gift bags. They also sang songs for them. While there they took the opportunity to sing Happy Birthday to Mrs. Whyte Holt who will be turning 99 on Friday, May 21! Mrs. Holt's son, Ronnie, was also there visiting her from Georgia. Happy Birthday Mrs. Holt and we look forward to singing to you next year on your 100th!